Large areas of south eastern Australia suffer from the threat of bushfires. The Heysen Trail is closed during these high risk times. This time, called the Fire Danger Season, generally runs between November and April, but different areas of the trail fall into different Fire Ban Districts, resulting in slightly different dates. Due to seasonal variations fire risk can vary, so the Fire Danger Season may be extended. The closure dates of the Heysen Trail are given on relevant maps and/or signs on the Heysen Trail. Signs on the Trail take precedence over dates given on maps. The most up to date information regarding these dates are available from the SA Country Fire Service (CFS) (or by calling the CFS on 1300 362 361), and takes precedence over both Trail signs and maps. 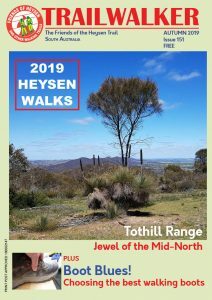 The viability of the Heysen Trail is dependent on the continuing co-operation of private landholders, so the trail closure times must be obeyed at all times. Some sections of the Heysen Trail remain open year round, principally those sections not on private land. These sections include public roads, Conservation Parks and Reserves (closed on days of Total Fire Ban), Forests (closed on days of Total Fire Ban) and vacant land. In summer, smoking is only permitted when resting (i.e. stopped walking) and in a cleared area with a four metre radius. Please ensure your cigarette is fully extinguished before moving on. You cannot light any fires on Forestry land, including Forest Reserves, between 1 November and 30 April in any year. For further information contact Ranger staff on 08 8521 1700. The dates given here are for the regular Fire Danger Season, and as already stated, the Fire Danger Season may be extended, so please check the actual dates that may be in place on the SA Country Fire Service (CFS) website: www.cfs.sa.gov.au or by calling the CFS Bushfire Information Hotline on 1300 362 361. Out of the fifteen Fire Ban Districts, only the relevant ones have been listed. Prescribed burns are often undertaken across the State in the lead up to the Fire Danger Season, near the end of the walk season. These are controlled fires designed to reduce fuel load. Details of prescribed burns can be viewed on the CFS website: www.cfs.sa.gov.au or by calling the CFS Bushfire Information Hotline on 1300 362 361. Some sections of the Heysen Trail remain open year round, principally those sections not on private land. These sections include public roads, Conservation Parks and Reserves, Forests and vacant land. Conservation Parks and Reserves and Forests are closed on days of Total Fire Ban. The CFS publishes these bans, as does the Bureau of Meteorology, in addition to broadcasted weather reports issued by the media. Map 1.1Heysen Trail Sheet Map 1A. Maps 1.1-1.3Heysen Trail Sheet Map 1A. Maps 1.5-1.6Heysen Trail Sheet Map 1B. Maps 2.8-3.1Heysen Trail Sheet Map 1D. Map 3.4Heysen Trail Sheet Map 2B. Maps 3.4-3.7Heysen Trail Sheet Map 2B -2C. Maps 3.8-4.1Heysen Trail Sheet Map 2C-2D. Maps 4.2-4.5Heysen Trail Sheet Map 2D. Maps 2.5-2.8Heysen Trail Sheet Map 5B – 6A. Maps 3.7-3.9Heysen Trail Sheet Map 6C – 6D. Maps 5.7-6.6Heysen Trail Sheet Map 8B – 8D. Clarification of the above information and maps showing smaller open sections can be found at Atlas of South Australia (activate the land use and Heysen Trail layers). View or print higher resolution version of map. The Google Map has a layer showing the Fire Ban Districts, if more accurate information is required of the district boundaries. The Country Fire Service (CFS) publishes information of Fire Danger Season dates and details of Fire Danger Ratings (Fire Bans in place), as well as a Current Incident list of bushfires, and details of Prescribed Burns. For current information visit the CFS website: www.cfs.sa.gov.au, download the CFS smartphone app, or phone the CFS Bushfire Information Hotline on 1300 362 361.